For many people, pets are a vital part of the family, and the special bond shared with them is as close as the ones shared with human relatives. Therefore, it is becoming increasingly common to include pets on family vacations. When taking a trip that includes four-legged friends, careful planning of each step of the journey is the key to ensuring safety and fun for everyone. Thinking about taking your pets on vacation? The main considerations that you must address include how to keep your pets comfortable on the journey, where to stay, and which pet-friendly activities to seek out on your trip. 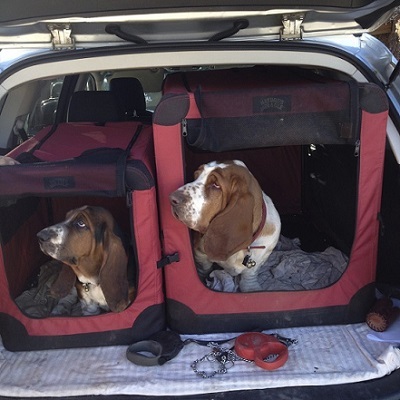 Whether you will be arriving at your destination by car or plane, transporting pets requires special planning. If you will be flying, the first step is to research your preferred airline’s pet policy. If your pets are small and will be permitted to travel under the seat in front of you, be sure to bring a well-ventilated, airline-approved carrier that is large enough to comfortably stow your furry friend. If you have larger pets, consider first checking with your veterinarian to ensure that their health and demeanor are compatible with a flight alone in the cargo hold. Plan to transport them in sturdy crates that are approved by the International Air Transport Association (IATA), have secure latches, and are clearly labeled “Live Animal,” along with your name and contact information. If you are driving to your destination, be sure to take a rest stop every few hours in order to let your pets stretch their legs and relieve themselves. As tempting as it is to allow pets to roam freely in the car, they should be kept in carriers or crates restrained by a seatbelt in order to help keep them and other occupants safe in the event of an accident. Regardless of your chosen means of transportation, it is crucial to ensure that your pets are up to date on vaccines, flea and tick medications, and other preventative health measures in advance of your trip. Have their medical records with you, as many airlines and hotels require proof of vaccinations. Any time you are traveling — and particularly when your travel companions include pets — selecting the right lodging accommodations is one of the most important steps in planning a successful trip. As you begin researching hotels at your destination, do not assume that a property truly welcomes pets simply because they claim to be “pet-friendly.” Many hotels that boast this designation charge additional fees or relegate guests with pets to the least desirable rooms. To determine whether you and your pets will be made to feel comfortable at a pet-friendly hotel, read reviews to determine how other four-legged guests have been received, and call the hotel to try and gauge their attitude toward animals. Ask whether they provide any special items or services to help pets feel more at home. No matter how welcoming of pets a hotel is, it is important to understand and abide by the rules. For example, many hotels ask guests to avoid leaving their pets alone in the rooms, as the unfamiliar setting may cause them to become anxious and disruptive to other guests. Therefore, if you are planning an excursion and will be unable to bring your pets along, either kennel them in their crate or find a nearby pet daycare to mind them temporarily. 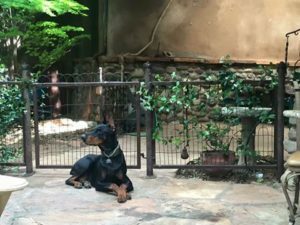 If you are considering a Southwestern getaway for your vacation, Sedona, Arizona promises a stunning and rejuvenating experience for humans and pets alike. Nestled in the heart of the state, Sedona is known for the profound beauty of its natural red rock formations, a thriving arts and culture scene, and a strong sense of peace and spirituality. 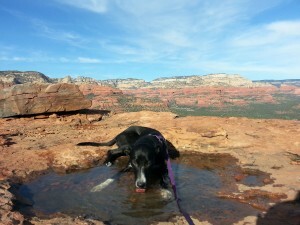 Sedona offers an exciting array of activities for pet owners. Visitors and their pets will enjoy strolling the streets of Uptown Sedona, which is filled with art galleries, boutiques, and restaurants, many of which have pet-friendly patios. The area is also home to a wide variety of hiking trails, with options suitable for different skill levels. Popular pet-friendly trails include Bell Rock Pathway, West Fork Trail, and Margs Draw, all of which offer easy to moderate treks as human and canine hikers enjoy an up-close look at the breathtaking scenery for which Sedona is famous. 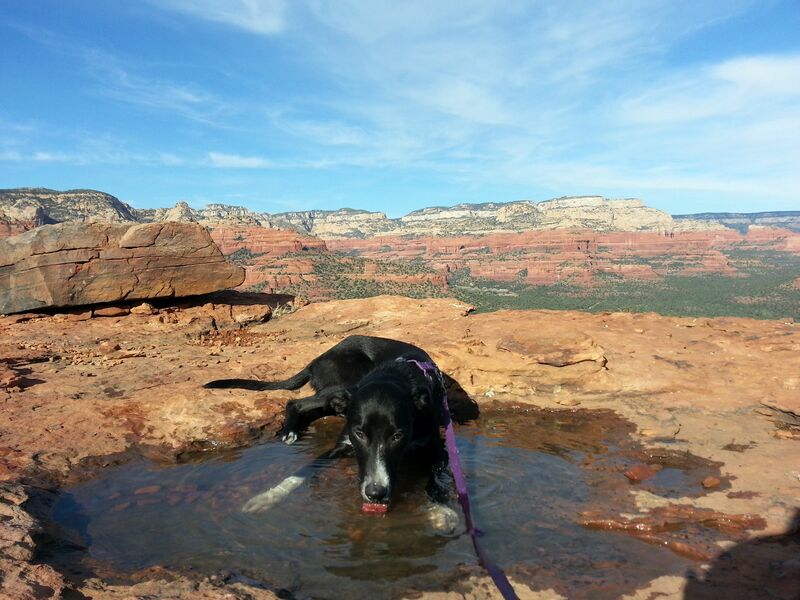 Pets are also welcome at Slide Rock State Park in the beautiful Oak Creek Canyon. 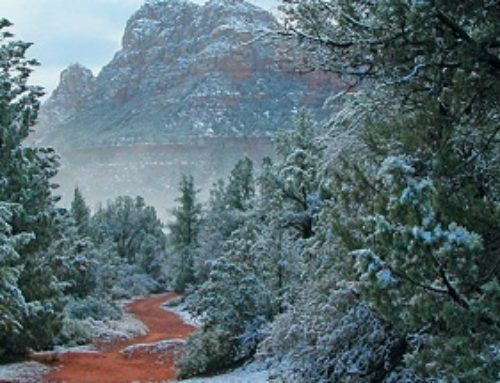 Due to its central location within Arizona, Sedona is a relatively short drive from many of the state’s highlights. Offering one of the most majestic experiences in the Southwest — and, arguably, the world — the South Rim of the Grand Canyon is only two hours away from Sedona. Leashed pets are allowed in designated areas of Grand Canyon National Park, including certain trails above the rim. There is also a kennel at the South Rim, allowing visitors to safely keep their pets while they explore the awe-inspiring beauty and magnitude of this natural wonder. The secret to visiting this world wonder is to make it a day trip from Sedona, thereby missing the crowds; leave Sedona by 8:00 a.m. and be back by 6:00 p.m., just in time for dinner. After a day of exploring Sedona and the numerous attractions nearby, visitors and their pets will be enthusiastically welcomed at El Portal Sedona Hotel, a twelve-suite boutique hotel offering unpretentious luxury in the heart of Sedona. El Portal does not charge any pet fees, and upon arrival, four-legged guests receive a basket containing treats, a blanket, and waste bags. Human and pet guests alike enjoy personalized concierge services throughout their stay. Six of El Portal’s suites have attached, fenced-in, pet-friendly patio spaces, and there are many walkable areas surrounding the property for dogs and their owners to explore. Several publications have recognized El Portal for its commitment to guest and pet satisfaction. For instance, Dogster Magazine recently named El Portal the second most dog-friendly hotel in the country, and USA Today’s 10Best.com travel award contest ranked it number one in the “Best Pet-Friendly Hotel” category. In addition, El Portal is a AAA Four Diamond Hotel, has been ranked as one of the top hotels in the Southwest by Conde Nast Traveler, and has consistently received TripAdvisor’s Certificate of Excellence Award. 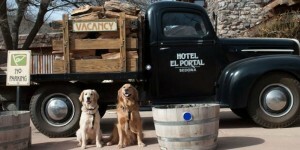 For more information on the El Portal experience for guests and their pets, visit www.elportalsedona.com.